I have been looking for a nice wrap dress that is easy wear while travelling. This little navy dress is all that and more. You can dress up or down by changing your shoes and makeup. I am 5'5" and this dress hit me at my knee there is a slight high low hem. I wish it would come with even hem as well. I ordered this dress in an off white colour, to my dismay the dress is see through in the sun-meaning that I need to wear a slip underneath it if I plan on wearing it out and not showing off my underwear in bright lighting. I love this dress- just wish the lighter coloured materials had more coverage as wearing it with a slip is more bulky and less flattering. The quality of the material and how this dress falls in one's body is so flattering. I loved it so much that I had to buy a 2nd dress. I usually wear an XS but for this style, I had to pick an XXS, both sizes (xs and xxs) are great for petite frames. I would go a size smaller if you’re looking for a more fitted look (like the model in the picture). I love the color, and very comfortable to wear. Great quality as well! Beautiful colour and fabric. The sleeves are a little long. I also worry about the dress slipping open. I wish there was a hidden button just in case. I have two of walance dress. Length is perfect for a short lady and the neck opening is easily to adjust using the waist tie. Get lots of compliments. I thought that I coudn't go wrong with a wrap dress for my petite hourglass frame (5,2 with 25 inch waist and 32D). I was wrong. It seemed to pull in an unflattering way around my arms and bust that made me look like a linebacker. The sleeves were a bit odd and have no structure.The fabric is beautiful and if I had smaller arms/upper body, it would likely be beautiful! Unfortunately, I didn't get to return the item on time. The perfect, casual dress to wear with heels or sneakers. So comfortable, too! I love, the draping of the material, exactly what I was hoping for from seeing the online photo. I feel feminine and well put together, again exactly what I wanted. So nice! The dress is beautiful and fits really well. The fabric is really high quality and falls nicely. I love this dress - I have two short-sleeved and one long-sleeved. Can be dressed up or down. I tend to be between sizes XS and S with Babaton - sized up for this style and I find that the extra material keeps the wrap in place without too much cleavage (I dont need dress tape or a pin). I ordered the pink one and I love it so much. You can wear it casually or dressy. Love this dress so much I got it in two colours! It's very versatile (can be dressed up or down) and has a flowy, feminine fit. The wrap at the front does sit a bitlow but I am small chested so was not bothered by it. Does wrinkle quite a bit, but wrinkles come out easily with a quick steam. Love this dress because you can dress it up or down. I wore it to a wedding, then to dinner with the girls. Great purchase! The dress is nice and the purple colour is beautiful but the sleeves on this are a bit weird. If you have fat arms it may not fit in that part. 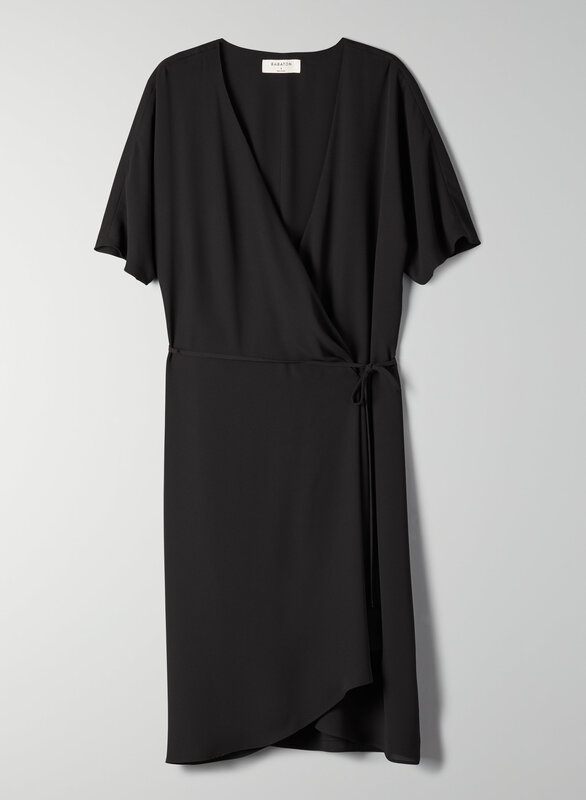 Love wrap dresses, and specifically this one. Have this in multiple colours because it's so flattering! Very flattering and super comfy - perfect for a Spring wedding I have coming up. I got two of them. They are beautiful and an easy fit. I would probably recommend sizing up if you're like D+ if you don't want it to be very low cut (and you want to be able to wear a bra). I'll probably keep my true size to be more of a going out/patio dress. It's very flattering and the fabric drapes nicely. I bought the purple version of this dress online and it's lovely! The fabric drapes nicely and it feels good to wear too. I would definitely buy another one, though a size smaller since it hangs a bit loose around the bust area if you're a bit smaller. I actually returned this because the colour I ordered didn’t work with my skin tone. However, this is a well tailored, flattering cut. It’s not too short and the fabric flows nicely but isn’t too sheer. Love this dress have it in two colours. The wrap is super flattering. Not too short (wore the black to a funeral) with a tank underneath to cover cleavage. Another time wore out with girlfriends without the tank. Super versatile! I had to pin it to make it suitable for everyday wear and will likely sew a tiny snap in where the pin is so it doesn't get damaged over time. .I bought this in the kinetic, which is the loveliest colour it comes in, imo. Love the dress. It cuts low in the front but is so flattering. I love this dress and I love that it’s machine washable and comes in a bunch of colours! It can be a bit tricky to tie at first, but I like that you can tie it tighter or looser as needed! The drape and length of the dress is perfect! This dress is beautiful; the fabric, length, cut, everything about it is great. Having a bigger chest, I have to warn you ladies about the openness of it. I wore it to an event and (even with double-sided tape) ended up tugging at my cleavage all night. This is a great dress to wear to work, out with friends or for a special event. It’s easy to dress up or down and it’s super comfortable. I want a second one in a different colour!